A new report outlines what requiring photo ID at the polls will cost the state and local governments and, thus, all taxpayers, as well as discuss the specific costs to individuals who currently don’t have identification. 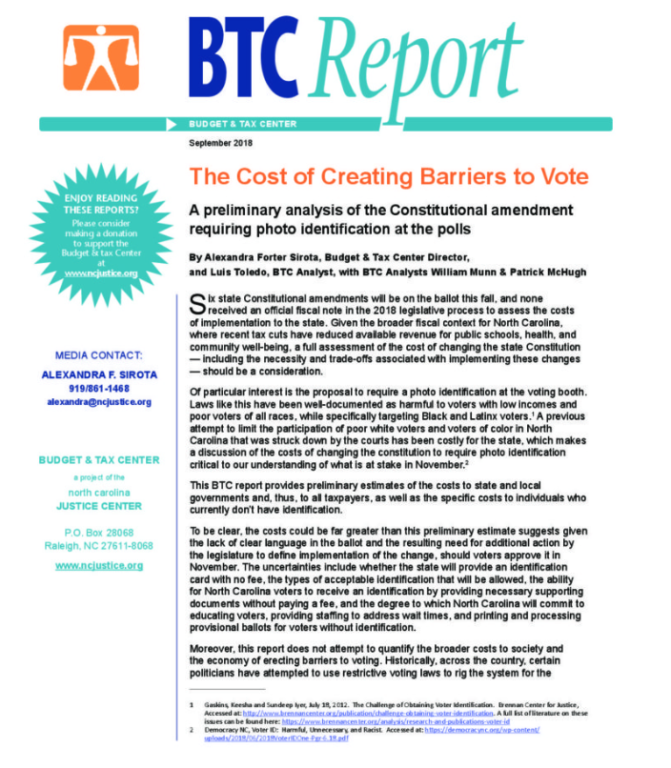 A new report from the Budget & Tax Center on the proposed Constitutional amendment to require a photo identification at the voting booth provides preliminary estimates of the costs to state and local governments and, thus, to all taxpayers, as well as the specific costs to individuals who currently don’t have identification. The cost of implementing a photo identification requirement could be $12 million if the state commits to providing a free identification option, which remains unclear in the ballot language. For individuals who are registered voters without identification, estimates show the costs could range from $18 million to $25 million, depending on factors such as travel times to DMV offices and wait times. The costs to all North Carolinians could be more than $12 million. While details about what the state will mandate under this amendment are not available to voters, the proposal as written would require the state to fund additional staff and education efforts to implement the new law. The state would also face substantial litigation costs to defend an amendment that could be used to revive discriminatory voter restrictions similar to those struck down by the courts. These costs come at the expense of investments that build thriving communities. These costs come at a time when austerity provides little ability to absorb additional costs without raising taxes and fees or cutting other services. These costs will necessitate trade-offs for other state priorities such as addressing underfunded K-12 classrooms and hurricane relief. Voters in every community would be impacted by this requirement, with disproportionate impact to voters of color and in rural communities. For the more than 218,000 individuals in North Carolina who are currently estimated to not have acceptable identification, the costs of securing one could be a hit to family’s weekly budgets. A preliminary estimate of these additional costs to individuals is between $18.9 million and $25.2 million. These costs will be disproportionately borne by people of color, and, while individuals without identification live in communities across the state, costs are also higher for individuals in rural communities, where elections are generally more costly to administer and individuals will have to travel further to reach state and county offices. For more information, contact Alexandra Sirota, BTC Director, at 919-861-1468 or alexandra@ncjustice.org; or Mel Umbarger, Senior Communications Specialist, at mel@ncjustice.org. In case you missed it: Read the Budget & Tax Center’s earlier report analyzing an income tax rate cap amendment to the state Constitution with particular focus on the costs of such a move for the state and for everyday North Carolina taxpayers. The nonpartisan Budget & Tax Center is a project of the NC Justice Center, which works to eliminate poverty in North Carolina by ensuring that every household in the state has access to the resources, services and fair treatment it needs to achieve economic security.